It began as a vacation Mecca in the early 1950s when country music legend Red Foley moved to nearby Springfield to host the 'Ozark Jubilee' radio show. By the end of that decade, the Mabe Brothers began performing twice a week in a converted building by the Lake Taneycomo waterfront. 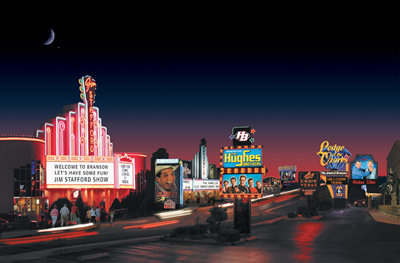 Other entertainers began putting on shows and in the 1990s Branson was dubbed the 'Country Music Capital.' Now, however, you can choose not only country shows, but also pop, swing, rock 'n roll, gospel, classical, and Broadway-style productions. There are more than 100 shows and they are offered at various times of the day from breakfast shows to matinees to evening performances. Choose current top performers or go nostalgic and see some of the favorites of decades past. You'll find the modern touch at the 20th century Celebration City theme park, which has dozens of rides, including the Ozark Wildcat wooden roller coaster. The historic Route 66 section sports 1950-60's era autos with drive-in diners, themed rides and shops. If you have time to soak up more culture, go through one or more of the nine museums ranging from a Veteran's Memorial to Ripley's Believe It Or Not. There is a toy museum, Hollywood Wax Museum, Roy Rogers and Dale Evans Happy Trails, and others. 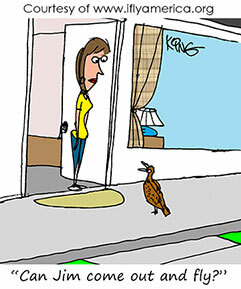 As you head for home, you are sure to comment 'I wish we had time to some of the other things while we were here.' That's just an indication you will return soon. The community of Branson wraps around Point Lookout Airport (PLK) with its 3,739-foot runway. Pattern altitude is 2000 feet for all aircraft. There are no landing fees but singles and twins have overnight parking charges. Approaches are: GPS, RNAV, and VOR/DME. Light maintenance is available. Rental cars are available on the field. 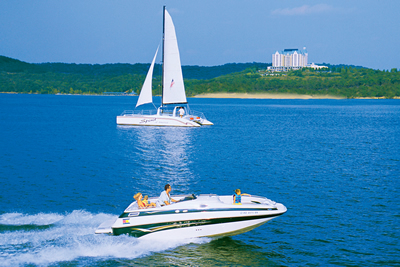 From fast food to fine dining, it's all in the Branson/Lakes area. There are national chain restaurants, buffets, and fine dining rooms. Try the barbeques or homemade apple pie. Many of the places offer sit-down service in their facilities or will deliver your choice to your hotel or resort.